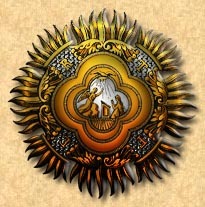 The Supreme Order of the Most Holy Annunciation is the highest order of chivalry given by the Royal House of Savoy. During the Kingdom of Italy period, it was also the highest order of that kingdom. The heereditary sovereign head and Grand Master of the order is H.R.H. the Duke of Savoy, Prince of Naples. In 1362, Amadeus VI, Count of Savoy instituted the order under the name of "Order of the Collar." Though its present Marian name had not yet been adopted, the original order was dedicated to the Blessed Virgin Mary celebrated as "Our Lady of the Annunciation." Originally the order had only fifteen knights, symbolic of the number of daily masses celebrated within the order. From then on, the order has continually been amended, even up to the 20th century with changes made by H.R.H. Prince Vittorio Emmanuele. Originally the order was reserved exclusively to distinguished military men. In addition to exemplary service, they had to be of Catholic and noble birth. Eventaully this requirement was amended to admit those who, though not of noble birth, had rendered distinguished service to the Kingdom of Italy or, since the fall of the Kingdom, to the House of Savoy itself. However, members still were generally required to be Catholic, though non-Catholics may be made honorary members of the order in rare cases. Today the number of knights are, as in the past, twenty. Knights must have already been awarded the Order of Saints Maurice and Lazarus. Regarding the current status of the Order, a Law of the Italian Republic of 3 March 1951, n. 178, art. 9 reads: The Order of the Most Holy Annunciation and the relative insignia are suppressed. 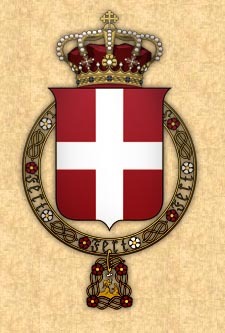 The Order of the Crown of Italy is suppressed and the award of the Order of Saints Maurice and Lazarus ceases. Awards which were already bestowed may, however, continue to be worn, but with all precedence in public ceremonies now excluded. There will be a separate law for other Orders and awards instituted before 2 June 1946. On this Pier Felice degli Uberti remarks "This law of the Republic could not in fact suppress the Order, since its original creation and the papal bulls confirming it placed it outside Italian jurisdiction; the authority of the Italian Republic could not extend beyond prohibiting it from being worn in Italy by Italian citizens. In 1962, the Italian Court of Cassation dismissed a prosecution brought against King Umberto II (who was in any case living in a permanent exile, imposed by the Italian republican constitution), on the grounds that Italy could not legally prevent the King from conferring the Order." Much dispute exists to this day between the Republic of Italy and the House of Savoy. This dispute includes the ownership of the Crown Jewels, among other things.